The Knots of May are a woman’s Morris team formed in the Autumn of 1974 in Brighton. From the first, a conscious decision was made to ensure the style of the team would be different from the predominantly male sides. 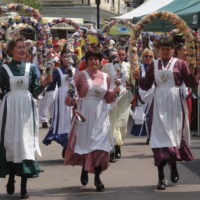 It was decided to concentrate on the dance traditions from the North West of England rather than Cotswold Morris, and the kit was designed to be feminine and reminiscent of the styles of the 1890’s. 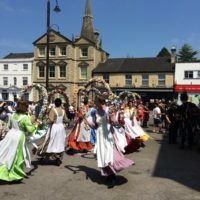 At that time, Lancashire Morris was being danced traditionally; the apron, being similar to those worn by Lancashire Mill girls, was chosen as another link. The first dances in the repertoire were clog dances from Lancashire – look out for the traditional Lancashire clogs that are worn – and shoe dances from Cheshire, performed with garlands or sticks. The sticks were thought to have originally been made from the empty bobbins from the cotton mills, which were decorated at each end with bundles of cotton waste. Since the early years in Brighton, both the team and the repertoire have become drawn from much further afield. Traditional English dances still make up half of the current repertoire, but they have been augmented by other European dances from France, Flanders and Spain. Several dances have been composed more recently, some of which were written especially for the Knots of May. In true folk tradition, some of the traditional material has been modified to suit the style of the team.